James Walter Fitzgerald, II, of 381 Hillside Avenue, Hartford, was born October 7, 1940 in Hartford, son of Massachusetts-born parents Marion A. (Stenberg) and James W. Fitzgerald. He was found critically injured at the circus grounds after the fire on July 6 and brought to Municipal Hospital where he received supportive treatment for five days, including plasma transfusion, until he passed away early morning, July 11. 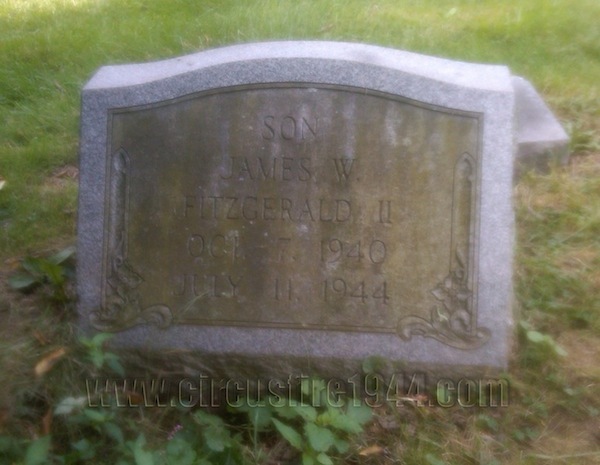 James was buried at Center Cemetery, Newington, after services at Taylor & Modeen Funeral Home on July 13. James leaves his parents; a brother, David A. Fitzgerald, age 6; and his maternal grandparents, Mr. and Mrs. Alfred G. Stenberg of Hartford. James' mother and brother were also injured in the circus fire, not fatally. His estate was awarded $6,750 by the arbitration board.